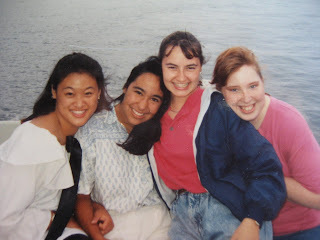 At the time I attended a state university and I was hungry for the camaraderie of like-minded LDS young women. My Mom had always spoken fondly of her experience in Lambda Delta Sigma at the University of Utah and I wanted the same for myself. While there wasn’t a chapter of Lamba Delt at my own school, a nearby community college had a chapter—I soon pledged and joined in the fun. I could say much about the relationships that grew from participating in the sorority—I first danced with my husband at a Lambda Delt-sponsored Halloween dance (he was dressed as a pirate!) and I met Dora, my lifelong sister-friend. But in this article I will focus more on the history of the sorority, given that it is so little remembered now that it and the LDS fraternity Sigma Gamma Chi were absorbed into the umbrella organization of LDSSA (except at the University of Utah, which apparently still has chapters of the LDS sorority and fraternity). Lambda Delta Sigma was originally a fraternity—founded under the auspices of U of U Institute Director Lowell Bennion on October 11, 1936. In January of 1937 a girls’ chapter was formed. By 1941 there were chapters on 15 other college campuses. In 1966 following a study by Seventy Paul H. Dunn, the LDSSA was formed to “correlate the activities of LDS students” and Lambda Delta Sigma was dissolved. However, it would soon return. Elaine Cannon, Winnifred Jardine, Frank Bradshaw and Alfred Nielsen were called by the general authorities to make plans for a new LDS sorority. It was then that the women’s group became Lambda Delta Sigma and Sigma Gamma Chi was formed as a parallel fraternity (note: Sigma Gamma Chi stands for “Service to God and Country”). Elaine Cannon was called as the new national adviser. She wrote the pledge ceremony, initiation ceremony, and chose other symbols for the new group. In November of 1967 the new organization was approved at the first National Convention of the Latter-day Student Association. Elected to office were Orlene J. Poulsen as president, Cecelia Foxley as vice-president, and Marva Coombs as historian. Other presidents included Nedra Warner in 1969, Barbara Winder in 1971, Arlyne Briggs in 1980, Patricia Romney in 1986. In 1977 the sorority was transferred to the leadership of the Relief Society General Presidency and the national Lambda Delta Sigma president served as a member of the General RS Board. By 1982, all Lambda Delta Sigma officers gained General Board positions. What is unclear to me, and warrants further research, is exactly when Lambda Delta Sigma was dissolved. At some point in the mid-nineties, both the church fraternity and sorority were disbanded and members were encouraged to participate in LDSSA. My experiences in Lambda Delta Sigma were priceless to me. I am sad that college women of this and upcoming generations don’t have the opportunity for membership in a church-sponsored sorority. Historical background taken from Lambda Delta Sigma Pledge Study Guide, 1987. Initiation ceremony taken from a xerox copy of the ceremony, circa 1990, in possession of the author. 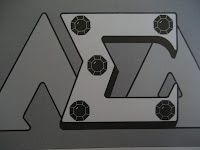 Photo #3: Drawing of sorority pin in the 1990s (an earlier pin had a cross and a starburst design)–the 5 jewels in the sigma character representing the 5 ideals of the sorority. Photo #4: Some sisters from the Chi Omicron Chi Chapter, UC Irvine, 1995 (can you see me & Dora?). Thanks, Jana. I had a great time with my fraternity after completing my mission and the draft, it was just what I needed. May be, some women just need to organize independently to maintain the tradition of Lambda Delta Sigma. I am not sure that the correlated church can meet those needs. Fascinating. I had never even heard of LDS sororities before. Did they ever function at BYU? The ideal of the Supporting Role of Woman!? Ugh. But other than that, it sounds like a great experience. I wasn’t crazy about my fraternity experience–it probably didn’t help that I was called by local priesthood authorities to be a Sigma Gamma Chi leader. I believe that BYU had the fraternity but not the sorority. From what I remember, the BYU chapter of Sigma Gamma Chi was exclusively for RMs that had joined before their missions at other schools and had attended BYU after their missions. Of course I have no first hand experience with this, it’s only what I remember from asking a similar question of the national frat/sorority leaders back in the early 90s. The initiation ceremony is lovely, though, taking examples of ‘elect ladies’ from the scriptures and using them as examples for women. I found it very empowering to listen to and officiate in the ceremony over and over (each time there was a new pledge class, which was usually twice/year). Though I had a bias against the exclusivity of the Greek system, I wanted very much to be a part of the same group as my Mom–so it meant a lot to me to be in Lambda Delt. Also, we didn’t charge exorbitant pledge fees (it was, maybe $15 or something like that) and many of our activities were service oriented. That pledge is lovely – and has nothing of motherhood and Top Homemakers of the World and The World to Come. It’s just lovely. A conference talk on these themes would be a nice soothing balm against all the motherhomemakermothermothermotherhomemakermothermothermotherwifemothermotherwifewifemother rhetoric. I’m a little tired of that. I did the sorority thing as well. I honestly don’t remember anything about the “supporting role of women”. I just remember having a good time and making friends. I also remember that most of the guys were not into the fraternity-they tended to dislike it. Oh my. There we are in all our collegiate glory. What I liked most about Labmda Delt is that we were so autonomous. Our advisor was such a wonderful lady, and I felt that I learned a lot from her. And there were opportunities for gaining leadership experience. And we were even instrumental in reactivating a couple inactive sisters, and had a couple non-members who were actively involved. It was like Relief Society, but voluntary and energized. Maybe that’s one of the reasons I have such a hard time with RS in general. I don’t know about anywhere else, but yes, LDS fraternities and sororities are still thriving at the University of Utah…I think there are 10 chapters of Sigma Gammi Chi and 16 chapters of Lambda Delta Sigma. I was never involved, but I know even today that each chapter president is called to the position as a “calling,” set apart and everything. Have the programs really dissolved everywhere else? I’ve had the impression that they exist only at schools that have a traditional Greek system (and enough LDS interest/Institute activity) so LDS students have a wholesome alternative. 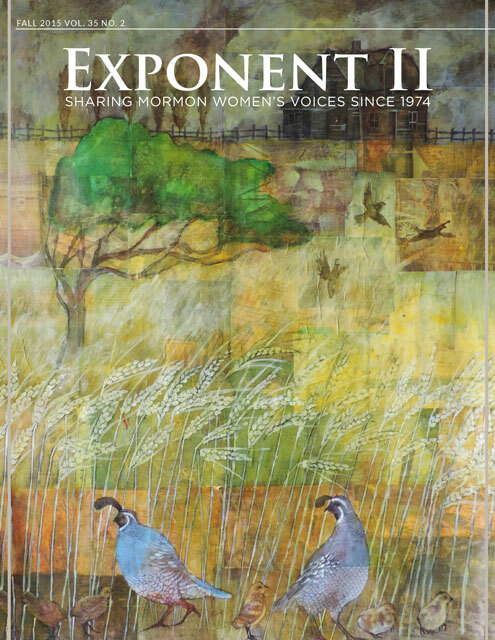 For more than 30 years, the Church’s Sigma Gamma Chi fraternity and Lambda Delta Sigma sorority have provided a spiritual, service, and social network for young adults. Beginning this fall, all the chapters of these two organizations will be part of the newly organized, more broadly inclusive Institute Men’s Association or Institute Women’s Association. The change is being made in order to draw in more young adults: the new associations can organize at institutes not affiliated with a university and on college campuses that do not have a Greek fraternity or sorority system. Potentially, every institute in the world could organize chapters of Institute Men and Institute Women. The presidencies of Sigma Gamma Chi and Lambda Delta Sigma will become the advisory boards for the Institute Men’s Association and Institute Women’s Association. 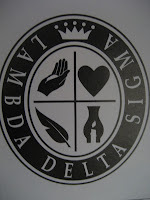 Jeannene Barham, president of Lambda Delta Sigma, who will serve as an advisory board member of the Institute Women’s Association, and Brother Jones both stress that the basic structure of the organizations will remain the same, with members participating in the same spiritual, service, and social activities. Nothing is being taken away from the current system. Rather, it is being strengthened and expanded. The 70 Sigma Gamma Chi chapters and 180 Lambda Delta Sigma chapters already in existence may choose to keep their Greek names, but they will function as chapters of the Institute Men’s Association and Institute Women’s Association, operating under the same guidelines and the same advisory board. In all chapters, U.S. collegiate traditions such as rush and initiation ceremonies will not be practiced. Area and chapter advisers will continue to work with area directors and institute directors. I started college in 2000, right after the change from Lamda Delta Sigma to IWA. I had a wonderful experience in IWA all four years of college. At Utah State we had around 20 chapters and a total of over 500 college women involved. IWA focuses on spirituality, sisterhood, service, and scholarship and activities are planned around those themes. It was much different for me than relief society in my different student wards — I had a much more intimate bond with my friends/sisters in IWA. Wow, I happened to stumble on this post, and it brought back a lot of memories. 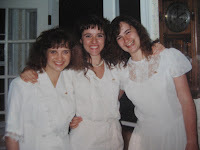 I was one of your non-LDS-member Lambda Delt sisters. I never felt any religious pressure, and it was nice to know a group of women of similar ideals (except the supporting role of woman bit – but that was never on our agenda). Even though I was not a LDS member, I always thought the ceremonies were lovely too. I agree with Jana that a sorority on a college campus allows a better forum to support each other in scholarship. How marvelous to hear from you! As soon as I get home I’m going to email you! I think that we supported each other a lot in sorority. I know that I relied on the officers to do not only perform their given duties, but to be innovative and creative in finding solutions for our new sorority. However, I do agree thatwe supported each other because we had a deep bonds of friendship, not merely because we were women. Okay, so please do contact me off-blog when you get the chance–I can’t wait to hear all about where you are in your life right now! (phddillyATyahooDAWTcom). that I tried to learn more about. He was a graduate of the U of U and a member of the Lambda Delta Sigma fraternity. It is so hard to find any info about it’s history, so I was grateful for your account of it.